“Don’t call them log cabins!” says the headline in a log home magazine from 1976. We are proud of the landmarks we’ve erected in the forty years that we’ve been log building, but we can’t help noticing that the owner of a sizeable log home still sometimes refers to it as “the cabin”. We might smile when we hear the term applied to a cottage that is bigger than our principle residence, but the sentiment is clear: everything has become so big these days that many people dream of downsizing with the same longing that they once dreamed of expanding. 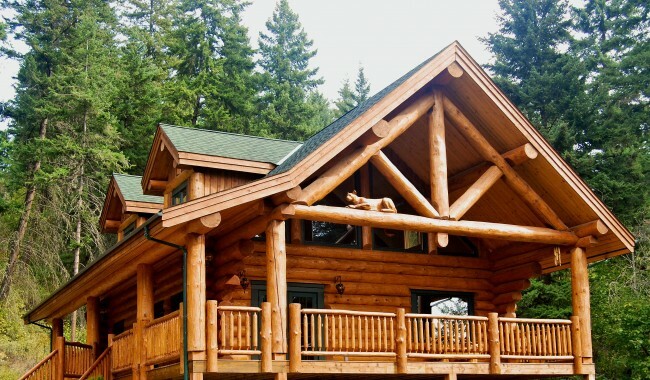 North American Log Crafters is rooted in the early stages of the 1970s log home revival. A co-founder of the International Log Builders’ Association, Ed Campbell remains a lifetime member and a frequently consulted expert on the industry and its history. He and his peers worked passionately to pioneer the handcrafted log home into a position of respect from its primitive reputation and humble origins. Their success has been phenomenal: a log home today is often impressive rather than quaint— a status symbol with only a polite nod to its heritage. The average size of an American family home has increased approximately 40% in the last 40 years, while family sizes have dropped significantly. What’s happened to the need to be grander? Did some people just get tired of vacuuming? Do we just not care as much about “keeping up with the Joneses” anymore? Or do we feel like our spacious rooms have filled with too much stuff? It’s different for everyone, of course, but many of us today feel want to slow down, simplify our existence and relax somewhere that represents a simpler life…like a log cabin. Cabin or castle, you can expect the same handcrafted quality in every North American Log Crafter home. Call today and tell us about the log cabin you’re dreaming about.